Fall is certainly in the air over here; the trees are decorating the skies with their red and gold autumn finery, even though the temperature in the day has still been in the 70's. We've gone from summer sun and heat to the coolness of the autumn.. seemingly overnight. I just hope we'll get enough sun and warmth to ripen the rest of the tomatoes still on the vines. Celebrate autumn with a beautiful new bracelet in classic autumn colors, or choose something unique and different: So many colors, so many motifs to choose from! Note: This was first written in Autumn 2011. 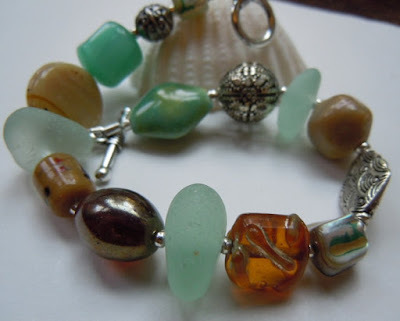 Unfortunately, none of the beautiful bracelets featured here are still available, but the sites at which I found the bracelets, Beach Glass Memories at Etsy and Novica, the National Geographic's Artisan shop, are still open for business. Etsy is always a favorite. Just look at this beautiful bracelet and earrings combo fromBeachGlassMemories at Etsy. They're made primarily of autumn amber beach glass. 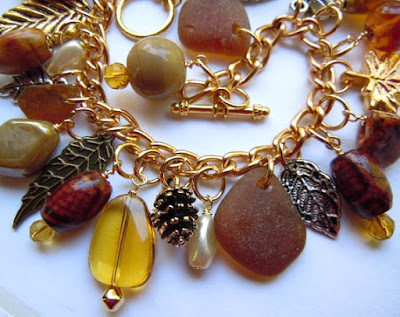 leaf charms, and beads on a gold plated bracelet. Classic and versatile. Details and purchasing information HERE. Here's another from BeachGlassMemories at Etsy. 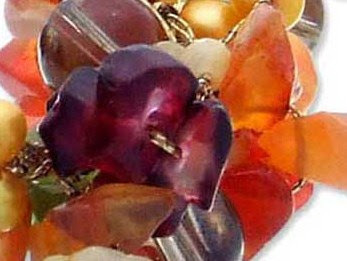 Sea glass in sea foam colors and autumn amber glass beads decorate this one-of-a-kind bracelet. Sea glass and that beautiful amber color always make me feel as though I am standing on a beach on one of those last warm Indian summer days with the wind whipping at my face. More details and purchasing information HERE. Remember that Etsy features handmade, one-off articles, and any article featured here may be sold.. If you really love a piece, you'll need to link over to BeachGlassMemories or any other favorite Etsy store pronto! However, even if a particular item is sold out, the artisan may have other similar pieces or may make a piece to your specifications. Novica is the National Geographic's artisan's shop, featuring hand-crafted gifts from some of the finest artisans. 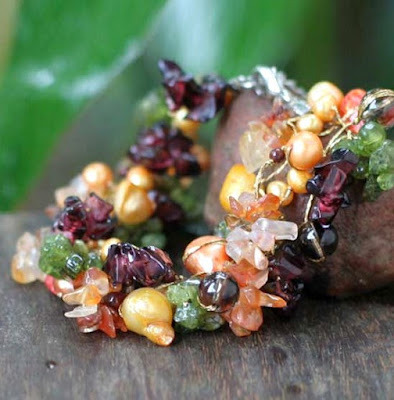 On this bracelet, "Precious Fruit", designed by Anusara from Thailand, pears, plums, grapes, and other fruits in colorful autumn glory are recreated from a mix of golden pearls, orange chalcedony, smoky quartz, peridot, and transclucent beads. The stones and beads are knotted on a golden silk cord. 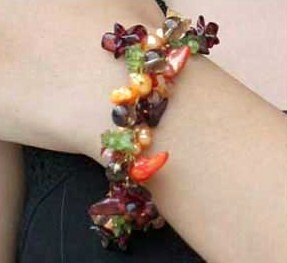 Check out the detail below and the bracelet as worn below that. More detail and purchasing information HERE. Is it any wonder why I love Autumn?